Designing a new headquarters for Telenor, Norway’s telecommunications giant, challenged architects to express the company’s vision for providing workers with the foremost creative working environment in Scandinavia — democratic, inspiring, technologically advanced, and sensitive to environmental issues. Consolidating 7,700 employees at 6,000 workstations distributed between eight distinct office wings combines an intriguing sense of place with incentives to interact and collaborate, and strenghthens Telenor’s abilities to do business. The idea to bring together more than 7,000 employees from 35 different locations in the Oslo area was the first step towards realizing Telenor’s goal. Unifying the company’s energy and resources within one site was recognized as the means to stimulate communication, connectivity, efficiency, and a stronger corporate identity. NBBJ formed a joint venture with the Norwegian firms of HUS and PKA to develop the concept, unity by proximity, on a number of levels. In contrast to a sprawling campus, a single building was envisioned that would be connected by a string of enclosed public spaces acting as a dense city with all of the amenities of daily urban living. On a spacious green site that slopes down to the sea, the project encompasses a total of 137,000 square meters along what used to be a runway at the former Oslo International Airport. 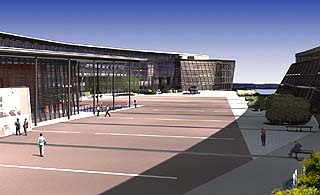 The structure is arranged along the east-west axis of the runway from which eight office wings branch out and are joined horizontally by two curved boulevards that gracefully embrace a central plaza. At every turn, sweeping fjord and mountain vistas are available to everyone equally throughout the complex. The central plaza defines Telenor’s main entry and spirit of collaboration. This space is surrounded by the eight office structures via a series of atriums that instill the project with high-energy movement. All employees and visitors arrive either by car beneath the plaza or by public transportation directly into a hub of activity in the plaza area. Here, a learning and information center offers hospitality and access to any other part of the complex. Over 7,000 employees will be housed in office wings like this one. The boulevards joining the office wings are the starting place for the headquarters’ plan to function as a democratic community. An exhilarating architectural statement of fluidity and movement, these two curved and bent glass structures become the defining image for Telenor. The spaces are comprised of activities that suggest a city center street, such as tea and coffee bars, cafeterias and shops that encourage chance meetings between workers, as well as among visitors. In this way, knowledge is shared, relationships are developed and ideas are generated. To bring the massive scale of the project to a personal level, a concept dubbed “office of the future” was devised. Offices are organized into working units of approximately 30 people, arranged individually or in modules of two or three units, depending on the configuration that maximizes natural lighting, views of Oslofjord, and workplace flexibility. 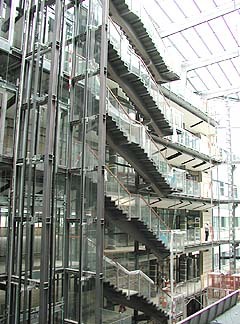 The spaces are connected vertically via their local atrium. Telenor’s new headquarters near Oslo features eight distinct office wings connected horizontally by two curved boulevards surrounding a central plaza. The atriums are key to realizing Telenor’s democratic ideals, as they serve to extend movement from the plaza and boulevards into other areas, and become the prime zone of interaction for people within these eight office wings. Variations in the number of floors, orientation and views give each working unit its own unique character and personality, providing employees with a recognizable home base, but also encouraging them to explore and visit co-workers elsewhere. Telenor’s open workplace design combines information technology solutions and sensitivity to the ways in which people work. Although each employee belongs to one particular unit, anyone can easily work at other places in the building. These solutions provide a wireless connection and access to personal mail and files wherever and whenever needed. At the same time, any workplace within one’s business unit can be utilized for daily tasks, whether requiring collaboration, concentration, intense discussions or quiet privacy. A learning and information center will be located in the project’s large plaza area. The scale of the offices further ensures a high quality of life for all employees. The floor plates are never more than 16 meters wide, allowing for natural daylight to reach almost all corners of the building. Additionally, natural ventilation, available at all points along the structure’s façade, is combined with individual solar control — louvers have been installed to provide screening from Norway’s intense summer sun. Telenor also has an aggressive “green” agenda, and has pushed the design team, contractors and other consultants to innovate and integrate environmentally-friendly issues into the project. Now under construction, Telenor’s headquarters will be finished next August. 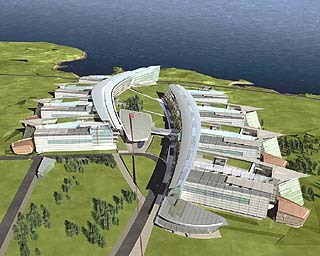 The results include the ventilation, solar shading and abundant natural light previously mentioned, along with reduced mechanical requirements, the use of water from the fjord as a heat exchanger to provide 80 percent of the help heating and cooling for the complex, the incorporation of sustainable materials into the facades, and the specification of sustainable and non-toxic materials for the interiors. In contrast to the site’s tangible experience with nature, Telenor’s high-tech capabilities were used to develop a virtual-reality model of the project that facilitated collaboration between the client and architects. This “visionarium” functioned as an immersive viewing system, allowing the client to participate in “walk-throughs” before the structure actually existed. The knowledge and understanding gained from this perspective was invaluable in terms of expediting the design process. A dramatic culmination of the building’s interior and exterior movements occurs at Telenor’s Customer Center, where visitors have a chance to experience the site’s spectacular vistas of Oslofjord and the city of Oslo from the east end of the project. The Customer Center provides exhibits, high-tech visualization presentations and an executive briefing center. Inviting access to the waterfront, as well, this interface with the outside world signifies Telenor’s broad democratic goals in a far-reaching gesture of collaboration. 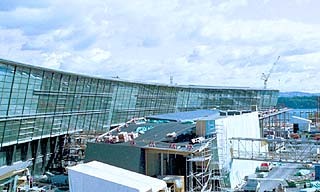 Telenor’s headquarters is scheduled for completion in August 2002. Peter Pran, FAIA, is a design principal/design group leader at NBBJ. Jonathan Ward, AIA, is a design principal/team leader at NBBJ. Jin Ah Park, AIA, is a design principal/team leader at NBBJ.